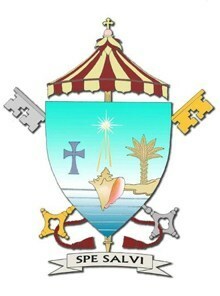 The Coat of Arms for the Basilica of St. Mary Star of the Sea, Key West: Based on the coat of arms of the Archdiocese of Miami, the position of the sand indicates that this parish was the beginning of the Archdiocese of Miami and is at the end of it. The conch shell is the conventional symbol of Key West. Of course, the star is for the parish's patroness. Below the cross and above the ombrellino is a conch pearl. The motto: Pope Benedict XVI introduced his second encyclical letter with the title, "Spe Salvi facti sumus" ("in hope we were saved") as St. Paul said to the Romans and likewise to us (Rom 8:24). Pope Benedict XVI concludes Spe Salvi with a comprehensive reflection on the parish's patroness, Stella Maris, Mary Star of the Sea. Archbishop Thomas Wenski conveyed the “news from Rome” to parishioners of the Key West landmark via a video played at all the Masses the weekend of Feb. 11-12. The official designation ceremony will take place May 31, feast of the Visitation. “Basilica” is a title of honor bestowed on a church of historical and spiritual importance by the Holy Father. Churches honored with the title basilica belong to two classes, major and minor. There are four major basilicas in Rome (St. Peter’s, St. John Lateran, St. Mary Major, and St. Paul Outside the Walls) and 72 minor basilicas in the United States, in addition to more than 1,500 other minor basilicas throughout the world. St. Michael the Archangel Church in the Diocese of Pensacola-Tallahassee — the oldest parish in Florida — became Florida’s fourth minor basilica this January. The other three are the Cathedral Basilica in St. Augustine, Basilica of St. Paul the Apostle in Daytona Beach, and the Basilica of the National Shrine of Mary, Queen of the Universe, in Orlando. “This designation is ultimately the consequence of your faith in Jesus Christ, and the faith of those who have been here before us,” said Father John Baker, pastor, in his homily to parishioners this weekend, when the church’s new status was announced. Father Baker’s new title is rector of the minor basilica of St. Mary Star of the Sea. He became St. Mary’s pastor in 2007 and said he noticed immediately a certain “good energy” or “karma” of holiness around the historic parish. “But what is the name for it?” he asked. To be named a minor basilica, a church has to demonstrate that it deserves the rank, both in terms of its historical significance, its architectural uniqueness and its spiritual characteristics. “We had to separate fact from fiction and document everything,” he said. The current church building, located at 1010 Windsor Lane, was dedicated in 1905, after a suspicious fire destroyed the original wooden church erected in 1852 on Duval Street, between Eaton and Fleming Streets. The new church was the first non-wooden place of Catholic worship in South Florida, according to the petition that was sent to Rome. Rectangular in shape with a central nave and two side aisles, the church can seat 500 but accommodate as many as 900, thanks to the “high and wide doorways set along the east and west walls” which provide cross ventilation and also allow people to assemble on the surrounding sidewalks. The grotto of Our Lady of Lourdes located on the grounds of the church is a well-known pilgrimage site, especially during hurricane season. Built in 1922, its construction was spearheaded by one of the Sisters of the Holy Name who worked at the parish, Sister Louis Gabriel. She had arrived in Key West in August 1897, just three weeks after taking her vows, and worked there until her death in September 1948. By 1922, she had survived three major hurricanes on the island, including one that lasted 17 hours and struck on Sept. 18, 1919, wreaking major destruction. She had the grotto built as a way of invoking Mary’s protection from future devastating storms. Click here to watch a video of the new minor basilica. It was accomplished very quietly, with the help of a select group of parishioners and archdiocesan officials, because the mere petition was “not a guarantee” that the church would receive the designation, Father Baker explained. Among the characteristics cited in the petition are St. Mary Star of the Sea’s status as a national and state-designated historic site. Its roots date back to the 16th century, when Florida was a Spanish territory and the island of Cayo Hueso fell under the auspices of the Diocese of Havana, Cuba. Most of those early settlers were “migratory fishermen from Cuba,” and the history of the church, along with that of Key West, has been intertwined with that of Cuba since those early days. Today, the parish has sizable populations of Hispanics, not just from Cuba but from Nicaragua and other countries in Central and Latin America, as well as more recently from Poland. St. Mary Star of the Sea also is the site of the first Catholic school in the state of Florida, founded in 1868 by the Sisters of the Holy Names of Jesus and Mary, who served at both parish and school until 1983. In 1986, the high school closed, but the elementary school continues to this day. St. Mary also is a place of pilgrimage for Catholics from other archdiocesan parishes; for college students from campuses elsewhere in the U.S. who engage in mission work during spring and winter breaks; for archdiocesan seminarians and priests seeking a quiet place of reflection; and for the black Catholic youth choir, which travels there each year. 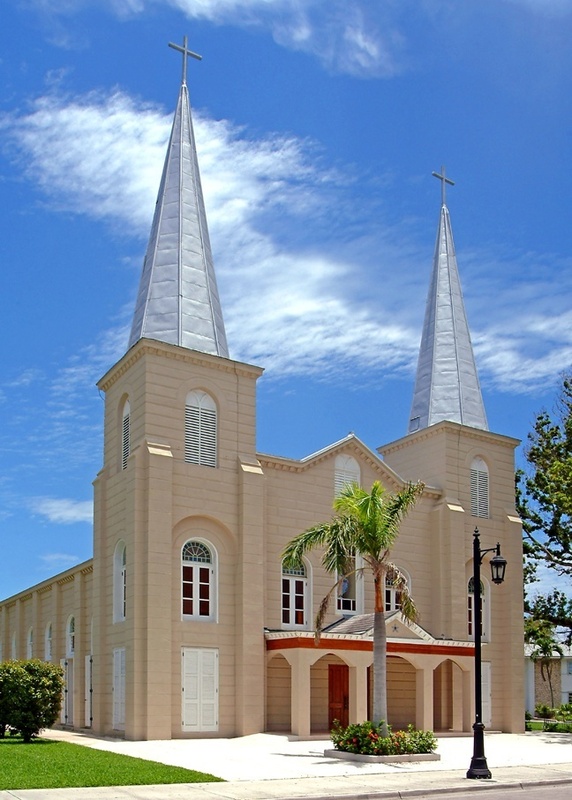 St. Mary Star of the Sea serves 1,300 registered families — Key West has about 30,000 year-round residents — as well as approximately two million visitors who come to Key West each year, about a quarter of whom are estimated to be Catholics. The parish also ministers to Catholics in the military bases and annexes that are located on the island. The nearest Catholic church is 30 miles away, St. Peter’s in Big Pine Key. In addition to Father Baker, the parish staff consists of a Jesuit priest from the Province of Dublin, a permanent deacon, a Marist brother of the New Orleans Province who works at the school, and three Sisters of Opus Spiritus Sancti from Moshi, Tanzania who serve both the parish and school. A perpetual adoration chapel, the Chapel of Divine Mercy, has been open since Sept. 8, 1995, and more than 500 parishioners are involved in devoting an hour each week to prayer before the Blessed Sacrament. For 35 years, the parish also has operated a soup kitchen for the homeless that now feeds 100 people a day, seven days a week. Since 2006, St. Mary Star of the Sea Outreach Mission on Stock Island has served the working poor of the community by allowing them to obtain food, clothing, furniture, prescription drugs and referrals to other social service agencies. The mission served 22,000 people last year. “There are consequences to the designation of the Basilica of St. Mary Star of the Sea which require immediate ... intermediate and long term responses,” Father Baker told his parishioners this weekend. "With this designation as a basilica, the Holy Father himself holds this shining light, St. Mary Star of the Sea in Key West, for the entire Catholic Church and for all people of good will to behold and to be inspired." Can we purchase any souvenir of this Historical Event.